Recently, I got a chance to install my own copy of SQL 11 (“Denali”) – CTP 1 and I must say, I was highly impressed that we finally have full integration with the Visual Studio shell, which means that the usability features available in the Visual Studio 2010 shell are also available to SQL Server Management Studio as well. The best example for this is clipboard ring, which has been documented by Pinal Dave (blog) and Chintak Chhapia (blog) recently. One things you would immediately notice is that the SSMS now has the provision of zooming both the content in both the query editor and the “Messages” tab from the Results window. We don’t have this on the “Results” tab, but I think that it will follow soon. Isn’t this feature a boon for anyone who needs to present on the big screen often? 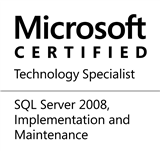 This entry was posted in #SQLServer, Blog, Imported from BeyondRelational and tagged #SQLServer on March 1, 2011 by nakulvachhrajani.